Cinema Vehicles has been the leading supplier of vehicle rentals to the film, commercial, and television industries since 1975. Today, our family-run business continues to be the first resource for movie cars for rent in Los Angeles and beyond. Our in-house inventory allows us to meet production needs quickly and seamlessly without any complications. Our fleet of more than 1,600 movie cars for rent in Los Angeles includes a wide array of options, including rent-to-wreck, nondescript, commercial, and emergency vehicles. We also have motorcycles, recreational vehicles, luxury cars, custom muscle cars, classic cars, doubles and triples. On the rare occasion that we don't have the exact film car rental you need, we can get it-or build it-for you! Our movie vehicle rentals have a reputation for being the best, made evident by how often our vehicles have been used in car-centric movies like The Dukes of Hazzard, Fast and the Furious, Herbie Fully Loaded, and The Italian Job. Cinema Vehicles has also provided out-of-the-box builds for a number of films, including the custom SWAT trucks from the 2016 Bourne movie, Jason Bourne and the spaceships and pods used in the Divergent series. Our showreel speaks for itself--no matter your vehicle rental needs, Cinema Vehicles has you covered. 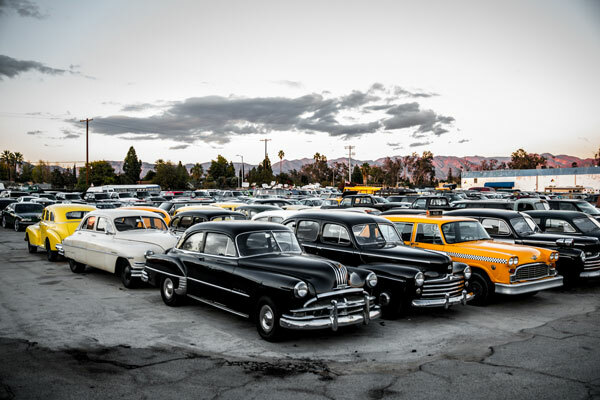 Explore our inventory of movie cars for rent in Los Angeles and browse our movie gallery today to learn more about our builds and get inspired for your feature film or T.V. show. Cinema Vehicles select classic car vehicle rental service.